Paulin Dementhon, Founder and CEO of Drivy, explained during a panel discussion at 4YFN-MWC2017 yesterday that the autonomous car and the “car as a service” model will make up the basis of the mobility of the future. The participants in the panel discussion “The Future Of Mobility: How Technology Is Transforming Automotive Industry” were Ogi Redzic, SVP, Connected Vehicles & Mobility Services of Renault-Nissan; Martin Hofmann, CIO of Volkswagen; Scott Lyons, Business & Partner Development – Connected Vehicle & Services of Ford; Anne Knierim, Senior Manager Technology Management and Research Policy of Daimler AG; and Ivan Mishanin, CEO of Bright Box. Paulin Dementhon envisions a future where the majority of cars are not owned by people, but by companies and entrepreneurs who will manage car fleets and make them available for citizens, turning the cars into a service for society. 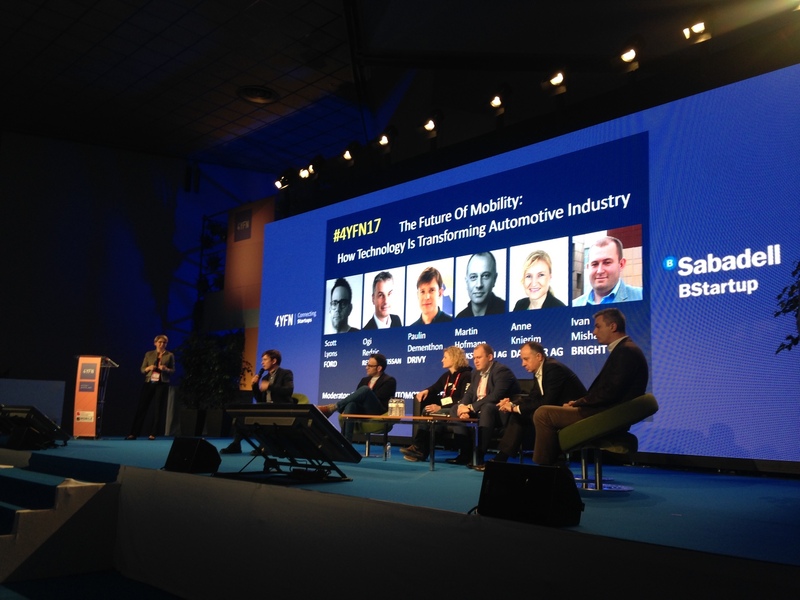 Drivy, the European leading car rental marketplace, participated yesterday in a panel discussion about the future of mobility organized by 4YFN, the event for entrepreneurs launched by Mobile World Capital Barcelona and GSMA during the MWC 2017. The Founder of Drivy - the only sharing economy marketplace participating in the debate - shared his vision regarding the future of mobility, and especially about how the arrival of the autonomous car will transform the entire industry. The Founder and CEO of Drivy pointed out that autonomous cars will be owned by entrepreneurs or companies that will manage their fleets and put them at the disposal of society. “In the future, private car ownership won’t exist anymore: in addition to being autonomous, cars will be shared”, he said. The car industry as we know it today, is experiencing a revolution thanks to new platforms that allow people to share cars. According to Paulin Dementhon, “today’s revolution in the automotive industry is as important as the advent of the car”, he went on to say that what is at stake is “a new usage, not the end of the car age”. One of the main conclusions of the debate, shared by all the speakers, was that technology has changed their business models and that the future will involve collaboration between car manufacturers and platforms like Drivy to offer a better service to users.